The first main category, ‘Construction of Identity’, was an overarching category for ‘citizenship’, ‘ethnicity’ and ‘religion’. 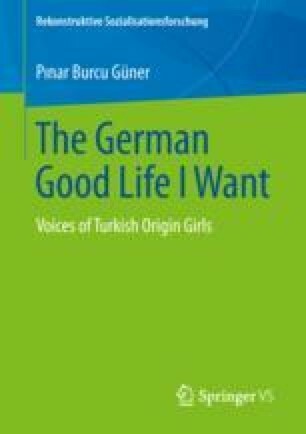 Citizenship was derived from the interview theme, “What is needed most for a good life?” In brief, it involved the advantages of being a German citizen and, in more detail, included the participants’ discussion on how German citizenship makes the lives of girls of Turkish origin easier. Some professions require German citizenship therefore the participants wanted to obtain German citizenship. The girls discussed what obtaining German citizenship means in terms of having a good life in Germany.